Actual, 38 and Shipping 40.5 Lbs Lbs. The MNE175XWP-SINGLE-E is our Export version. It is the same E-Panel but with the proper color wires and proper breakers for a 230v 50hz inverter. The MNE250XWP-SINGLE-E is our Export version. 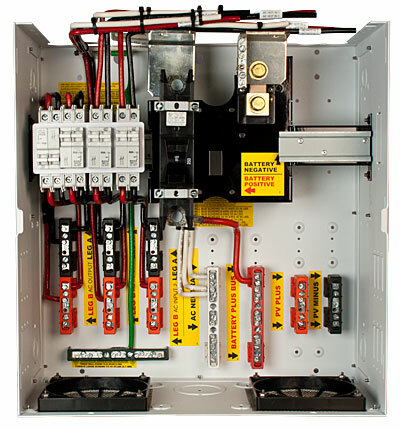 It is the same E-Panel but with the proper color wires and proper breakers for a 230v 50hz inverter. The XW MPPT controller requires no mounting bracket. FM60, FM80 and Classic require Right or Left E-Panel charge control mounting brackets. Right hand bracket furnished standard. Left hand Charge control bracket: $20.00 weight: 1 Lb. Description: E-Panel for a single Schneider Electric XW Plus inverter/charger. The XW Plus inverter is mounted directly above the E-Panel for a 16 in wide assembly. 2/0 Cobra X-Flex battery cable with tin plated lugs and glue filled white or red heat shrink. UL Listed. 4/0 Cobra X-Flex battery cable with tin plated lugs and glue filled white or red heat shrink. UL Listed. The KID is the most versatile medium sized charge controller on the market. Ideal for small renewable energy systems. SMA and XW short back plate for inverter and E-Panel.